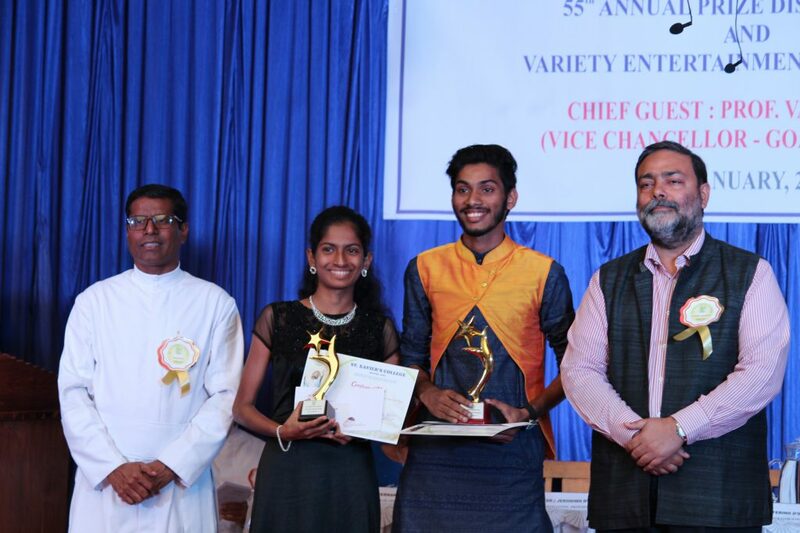 St. Xavier’s College, Mapusa, celebrated its 55th Annual Prize Distribution Day on 12th January 2019. This auspicious event was graced by Chief Guest, Prof. Varun Sahni, Honourable Vice Chancellor, Goa University. On behalf of the Diocese Society of Education (DSE), Rev. Fr. 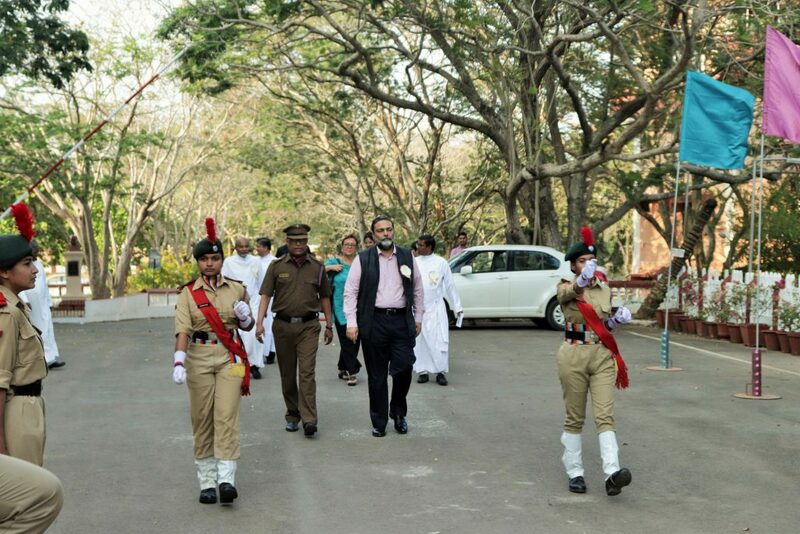 Zeferino D’ Souza, Administrator welcomed the gathering and acknowledged through the college vision and motto that the “youth are the future of the state and the country.” He encouraged students to be good human beings in their journey to achieve success, name and fame. Quoting Malcolm X who said “Education is the passport to the future, for tomorrow belongs to those who prepare for it today”, Fr. (Dr.) Jeronimo D’Silva, Officiating Principal opined that “Education should help students to cultivate new knowledge and provide the right leadership to aid them in developing their potential to the full.” He went on to present the College Annual Report which recorded the achievements of the students and faculty of the college in academics, sports, research and co-curricular activities. Recognizing St. Xavier’s as a house of learning with its A grade status, Chief Guest Prof. Varun Sahni, who co-authored ‘Technology Vision 2035’, a Government of India initiative, stressed upon the need for improvement in India’s socio-economic status, e-governance, energy and habitat, health and educational improvement. He informed the audience of the 12 individual and collective prerogatives that should be everyone’s right in India and the 10 grand technology challenges as part of this technology vision. Drawing inspiration from M.K. Gandhi, he summed up saying that there is a desperate need to have an education system that relies not only on the head but the heart with value education and the hands with skill-based education. He assured youngsters that if they pursue their goals with “Mehnat, Himmat aur Lagan” namely effort, courage and devotion, the world is theirs for the taking. Meritorious students of the college including distinction students at the Third Year University Examination 2017-18 were felicitated at the hands of the Chief Guest. While a token of appreciation was presented to Prof. Sahni, Mr Akif Agha, General Secretary, Student Council, proposed the vote of thanks and appreciated the presence of all the dignitaries present. This was followed by a Variety Entertainment Programme presented by the students of the various Cells, Clubs and Associations of the college. It included dance fusion between Kathak and Bharatnatyam, an English play titled The Surgery, an adaptation of a short story by Anton Chekov’s short story, A Capella, a hilarious Konkani skit titled Magir Kitem Zalem? with a message that highlighted the consequences of speedy and rash driving, Duet singing, an entertaining performance of the Goan Kunbi folk dance and the traditional Mando. Comperes Mr Govind Mopkar and Ms Krysla Menezes set the right tone for the occasion which concluded with the singing of the national anthem.